In 2008, within two week's of each other, Danielle had her first asthma attack right before turning one years old and her older sister Jamie had her first seizure. What followed was endless hospitalizations and doctor visits that gave us the idea to start Angels4Epilepsy. We started out by delivering to our local chidlren's hospital in Augusta, Georgia and followed up with a delivery to Wolfsen's Children's Hospital in Florida and then the Ronald McDonald House in Augusta. We also co-founded and funded a matching program in which we provided over 50% for each handmade teddy bear that was shipped to a child undergoing an epilepsy related procedure. We have just concluded that project and over 100 our mascot bear were shipped and a successful Facebook support group for parents was established. In August 2013, we founded a new Facebook support group to include children with asthma. 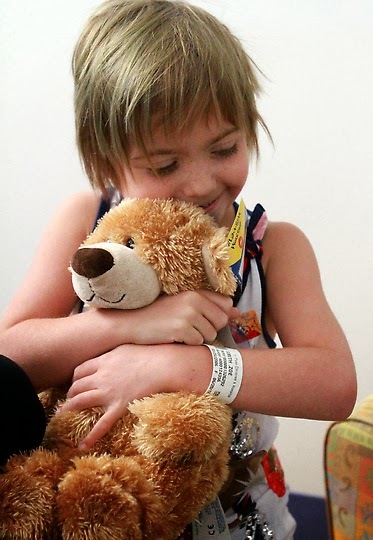 To date, over 60 stuffed animals, Jamie's book, "I Have Epilepsy. It Doesn't Have Me," and USB medical history bracelets have been mailed to children in the US and the United Kingdom. Jamie has been a winner of grants and recognition through the years for her efforts ranging from Pepsi Refresh Grants to Build-A-Bear products to Walmart Grants. She has also been a multi-winner of Build-A-Bear Huggable Heroes and Kohls Cares for Kids Scholarship winner. We hope to see Danielle winning a few herself now that she's fully active.